WATERLOO, Iowa --- Deals were made in cash, but smiles constituted the real currency of the day at Christmas in Walnut. 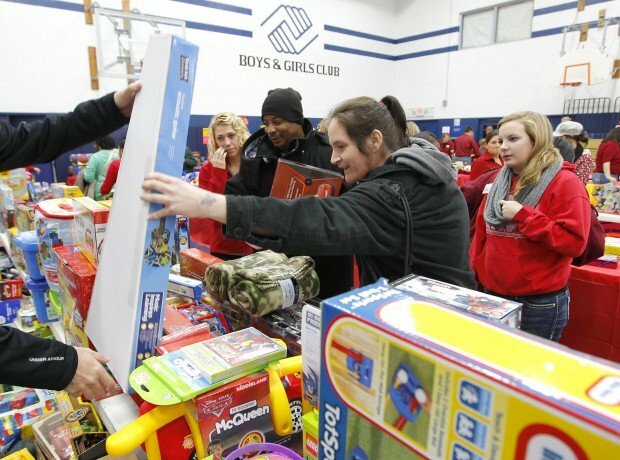 For the third consecutive year two area churches teamed up with the Boys & Girls Clubs of the Cedar Valley Saturday to offer discounted gifts to low-income families, along with crafts activities for kids and a free breakfast. The event keeps getting bigger as word of mouth spreads in the community. A total of 500 tickets were given for the event and people lined up around the Boys & Girls Clubs building on Walnut Street, waiting for their chance to select gifts. "If you look around you see smiles and hugs and good cheer," said Chuck Rowe, chief executive officer at the Boys & Girls Clubs. "It's contagious and it's fun to be a part of." The two churches, Heartland Vineyard and Orchard Hill, helped put together the event three years ago. They receive donations of cash and gifts and assemble an army of volunteers, numbering about 400 this weekend. Gifts between $10 and $30 retail value are discounted to $2 or $5 per gift, and those attending the event are allowed to buy up to five gifts. Shara Harmon of Waterloo hasn't missed a single Christmas in Walnut. Her children were spending the morning with their grandmother while she gathered an armload of gifts. She laughed and joked with friends while working her way through lines at the event. "It's a blessing that they do this," Harmon said. "It helps families that aren't as fortunate to purchase presents that are very expensive in the stores." The event earned recognition this year when the University of Northern Iowa Nonprofit Leadership Alliance Student Association gave the Bob Koob Award for Collaboration for the community effort involved. While parents shopped, children kept busy upstairs doing crafts with still more volunteers. Some built things for themselves while others were looking to share. Jill Van Veldhuizen, an art teacher and a volunteer, sat at a table patiently cutting slits in small pieces of green fleece. Time flew by as she cut as many as 100 for each small Christmas wreath, all the while keeping up a near constant chatter with young children excited about Christmas and their chance to make a gift for a parent or a favorite brother or sister. "The kids have been wonderful, very patient. They're very excited and can't wait to give these away. Mom seems be the favorite, but many of them are making something for a brother or sister," Van Veldhuizen said. Megan Barnes, one of the organizers from Orchard Hill Church, said about 2,500 gifts were collected this year. 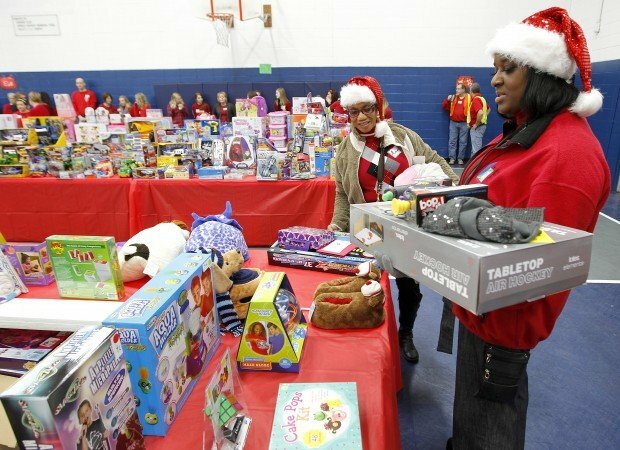 "I think it's empowering --- the people are able to pick out gifts for their family and the money goes back into their community," Barnes said. Money paid for the gifts is donated to schools attended by children who come to Christmas in Walnut. Donations, including leftover toys or sports equipment, are also made to the Boys & Girls Clubs.